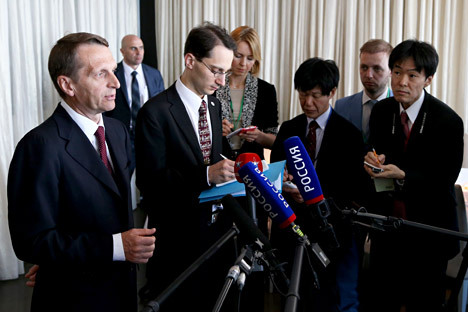 Sergei Naryshkin (left) taking to journalists at the Russian-Japanese Forum on Cooperation in Business, Technology and Culture in Tokyo. Bilateral trade in the first 10 months of 2015 stood at $17.7 billion. The volume of trade between Japan and Russia in the first 10 months of 2015 decreased by 38 percent due to low oil prices, Japanese Ministry of Finance officials told TASS. Bilateral trade between Russia and Japan in the first 10 months of 2015 stood at $17.7 billion, compared to $28.3 billion in the same period in 2014, according to the report. The Japanese Ministry told the news agency that Russia has a trade surplus of $9 billion with Japan this year. U.S. and Japan posing as alternatives to Russia and China in Central Asia?